Well, here we are. 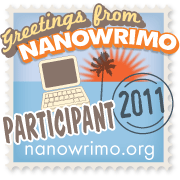 This writer’s experiment actually began back in July of 07 on LiveJournal. As I progressed (albeit slowly) I found that the format of that site was not conducive to what I needed. Now I’m here at WordPress and have been pretty pleased so far. I’ll soon start posting some chapters and stories I’ve already started and already appeared in other places. Then the real work begins. Hopefully a fresh start will keep me going. Bear with me on a bumpy beginning though. This entry was posted in Announcements and News and tagged blog, welcome, writing. Bookmark the permalink.